GYPSUM, SELENITE & DESERT ROSE ARE THEY RELATED? Gypsum is composed of hydrated calcium sulphate and takes many forms, occurring as tabular, bladed and diamond shaped crystals. it also occurs in fibrous form, and in compact, granular masses, and as rosette shaped aggregates with included grains of sand. Gypsum varies from colourless to white, gray, yellowish, reddish, greenish, and brown. Gypsum has several variety names that are widely used. 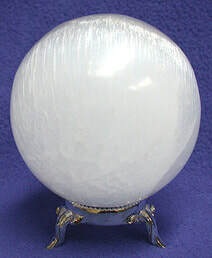 Selenite is the colourless and transparent variety that shows a pearl like luster and has been described as having a moon like glow. The word selenite comes from the greek for Moon and means moon rock. Another variety is a compact fibrous aggregate called Satin Spar. This variety has a very satin like look that gives a play of light up and down the fibrous crystals. A fine grained massive material is called Alabaster and is an ornamental stone used in fine carvings for centuries, even eons. Desert rose is the colloquial name given to rosette formations of the minerals gypsum and barite with sand inclusions. The 'petals' are crystals flattened on the c crystallographic axis, fanning open along characteristic gypsum cleavage planes. Crystals of gypsum can be colourless and transparent, making a strong contrast to the most common usage in drywall. The crystals can also be quite large. Gypsum is a natural insulator, feeling warm to the touch when compared to a more ordinary rock or quartz crystal. Sheets of clear crystals can be easily peeled from a larger specimen. If making crystal water use the indirect method as all these crystals dissolve in water. Clean the stones by placing in sunlight or burying in salt. When the term "alabaster" is used without any qualification, it invariably means a fine-grained white variety of gypsum which historically has been used for statutory and other religious and artistic iconography. Alabaster draws things and people to you when you need them in your life. Such as the "coincidence" of meeting a person who is able to provide a service that you need in that time and place. 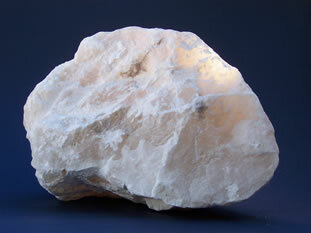 Alabaster eases tension headaches, increases concentration and problems related to painful joints. It corrects hormonal imbalance in the body. It assists in reducing unwanted negative emotions and unnecessary anger. This stone is also used for easing anxiety and nervousness. Alabaster encourages you to forgive yourself and others for past and present mistakes and it inspires you to find the good in all things. Alabaster stones are believed to stimulate Baset Chakra and Sacral Chakras. In the process of stimulating Root Chakra, which is known as the base of the spine, then lie on your stomach and put the alabaster crystal on your lower back. The rosette crystal habit tends to occur when the crystals form in arid sandy conditions, such as the evaporation of a shallow salt basin. Gypsum roses usually have better defined, sharper edges than barite roses. 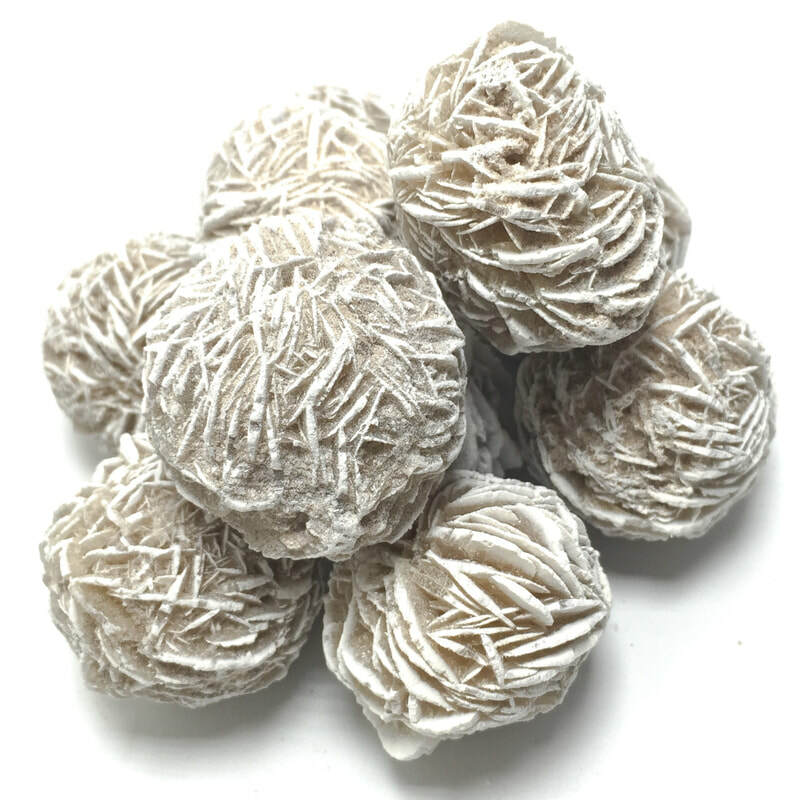 Desert Rose provides you with spiritual nourishment and contacts the Mother Goddess. It facilitates you feeling cared for, safe and cared about. This stone promotes knowledge of being taken care of by the universe. Desert rose enhances feelings of security, safety, understanding that all is well, inner peace and knowing that you are valued in the universal plan. It provides emotional support for breastfeeding mothers and helps with lactation problems. Desert rose helps dissolve self imposed programming that you no longer need. It is used for affirmations and creative visualisation. Satin spar selenite is the fibrous variety of Selenite. It is generally white, silky and translucent with pearly or milky appearance. Satin Spar Selenite can be cut into very striking chatoyant cabochons. Historically, the name Satin Spar was first applied to a variety of calcite. Satin spar is considered to help regularise a woman's hormones and menstrual cycle. It eases migraine and visual disturbances caused by PMS. It will reduce scar tissue, speed recovery from surgery especially gynecological ones such as caesareans. it encourages bone growth and strengthening particulare osteoporosis. This stone enhances skin health. Satin Spar is a calming stone when life has become stressful and hectic. If you are lethargic and uninspired this stone will give you energy and increase your creativity. This stone is ideal for children and adults who suffer from hyperactivity. Selenite is a transparent, colourless variety of Gypsum. Selenite is named after Greek word for the Moon, referring to the moonlight effect from cleavage surfaces. Selenite is a variety of Gypsum that occurs in transparent crystals or crystalline masses. It is often colourless with a vitreous or pearly lustre. 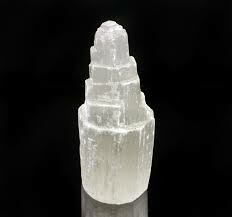 Selenite brings clarity of the mind, it opens the crown chakra. With this stone you can access angelic consciousness and higher guidance. Selenite helps you anchor yourself to the earth. Selenite is excellent for meditation work as it brings a deep peace so that meditation or visualisation can be achieved more easily. If you are telepathic this stone will help you in your task. 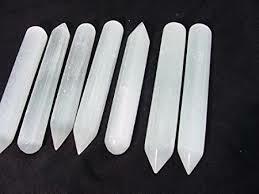 Selenite can be used to set up a protective grid around the house, which creates a safe place for you and your family. Place the stones at the corners of the house. Selenite will show you issues and lessons that you still need to fix. It can be used for scrying to see the future or the past. Selenite helps judgement and insight. It clears confusion and helps you see the big picture. It is a disperser and stabiliser of erratic emotions. Selenite aligns the spinal column and promotes flexibility. It wards off epileptic seizures. It is a crystal for breastfeeding and nurturing a child. It is the ideal stone if you are having trouble bonding with your baby.